The Lincoln Electric K2185-1 Handy MIG welder is a portable, lightweight and compact wire feed welder that is designed for home and hobby use. 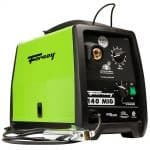 In this article, you will find further information about this affordable welder from Lincoln. Which materials can you weld with the K2185-1? In this short video, the experts from Lincoln electric explain the main functions of the Lincoln Electric K2185-1 Handy MIG welder. The package includes basically everything you need to start your welding job: The base unit, a welding gun and the cable. Of course, cable and work clamps are also included. Additionally, you can count on a spool of flux-cored wire, contact tips, a chipping hammer and a brush. 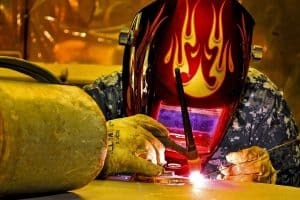 Moreover, you can count on the gasless nozzle for flux-cored welding, as well as the gas nozzle, gas regulator and the hose to immediately start with your MIG welding tasks. Please make sure to get additional safety clothing. Plug it into your 115V standard household plug and you are ready to go. You can choose between four output voltage settings. With an output current of 35 – 88 A it is in the lower current range. Weld mild steel from 24 gauge up to a thickness of 1/8″. For a starter, everything is included in the package. Moreover, you can use this MIG welder for gasless flux-cored welding too. With a weight of only 46 lb it is a portatble device that is easy to carry around. For maximum portability, you could consider to invest in a welder-generator to provide power to the welder. 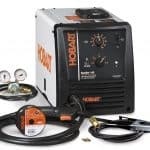 The Lincoln Electric K2185-1 Handy MIG is an ideal device for you, if you need an affordable, very lightweight and thus portable device for light-duty welding tasks. The adjustment of your welding parameters is easy: You have a 4 settings voltage knob and the continuous wire feed speed knob to select the power and wire speed of your desires. When you attach a spool gun and a gas regulator, you even can MIG weld with additional shielding gas. To provide a high level of safety, an integrated cold contactor feature keeps the welding wire electrically “cold” until you press the gun trigger. Furthermore, an integrated fan helps to cool the device and avoids overheating. Thus, you can count on a longer device life compared to MIG welder without integrated cooling. Last but not least, Lincoln provides a 1-year warranty on this welding machine. To sum it up, the K2185-1 MIG welder is a solid device for home-use and hobby projects. On the downside, because of limitations in power and duty cycle, this not a welder that is suited for professional, industrial and heavy-duty weld-jobs. It is not recommended to weld metal sheets thicker than 1/8″ with the Lincoln Handy MIG. For thicker materials, you need a device that has a higher power output rating like the Lincoln 180.